Not Just Another Mother Blogger! : Itsy Bitsy Spiders? My husband sent me an email last week that did not contain a picture of a dead snake. 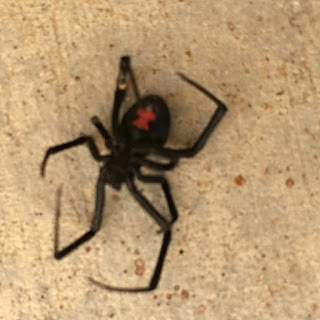 A coworker had found this spider on the ground outside of the school and took a picture of it, the email said. I was confused. Black Widows like dark, musty spaces where they can be left to their own devices. Middle schools are not an ideal location, what with all the teenagers who like to run amok. Also? That spider is HUGE. Like, Shelob-sized. Surely someone would have noticed it hanging out? A spider that big belongs in a dark corner of a pig sty, weaving the words "SOME PIG" in their web. My husband's school is only a few years old, and it was built in the middle of nowhere, cow pastures and scrub all around. Erecting a large building in the middle of nowhere causes much upheaval among the critters who live in such areas. They don't understand what is happening, but they try to go on about their business anyway, and then they encounter people. Terrified, hysterical people who stomp first and ask questions later. Honestly, I am not even sure how our species managed to evolve from fierce hunters into these shrinking violets. Take snakes, for instance. Seeing a snake doesn't bother me in the least, because it isn't an evil cockroach plotting to take over the world. Cockroaches are a perfectly appropriate thing to fear. Snakes eat cockroaches, in fact. So snakes are awesome. On the other hand, was this particular spider fake? I looked at the picture again. Nobody stomped on that spider. It looked as though it had just died, perhaps of old age, in spider terms. The legs looked kind of off to me. But why would someone bring a fake Black Widow spider to a school and drop it at the door? Did it fall out of someone's pocket? I decided that I was overthinking the entire situation. I do that. Whether this spider is deceased or fake was irrelevant at this point. If it was real, I hope it died of natural causes, but whatever. It's in spider heaven, snacking on freshly wrapped flies and spinning the most beautiful webs ever. Ewwwww! Although I'm more afraid of snakes than spiders.